On 19th June 2017, the battle for Mosul entered its fiercest phase, as the Iraqi army tried to retake the last quarters of the Old City from the Islamic State group. Rana explains, “Ahed’s family were living in the area. They tried to flee, but the Islamic State fighters brought them back and put explosives around their house before climbing on their roof to use it as a strategic position. Soon after, two airstrikes hit the neighbourhood. Seventy families died within a few minutes. Ahed, two of her sisters and a neighbour were the only survivors.” She survived, but her body was riddled with shrapnel. Twenty-two months later, she still hasn’t fully recovered. Saif and Ahed are nine years old and Salim is eleven years old. The three of them are being treated at MSF’s post-operative care facility, in East Mosul. A few beds away from Ahed, a teenage boy called Ali is lying on his bed wide awake. Metal scaffolding surrounds Ali’s leg, but he doesn’t seem bothered by it. The 14-year-old is furiously playing on his phone. Without taking his eyes away from the screen, he explains the purpose of the video game to the doctors that stop by his bed for their daily medical round. In the game, Ali is parachuted onto an island and has to scavenge for weapons and equipment to kill others, while avoiding getting killed. “Back at home, my older brothers were playing it, but my mom did not allow me to. She kept saying that it was too violent and I was too young, that I was still going to school. But here, she’s a bit more flexible; she knows I easily get bored.” Ali has been at the facility for the past two weeks after he fell off his bike and severely injured his leg. Not all the patients here are war-wounded, MSF also treats people injured in everyday accidents. Ali, 14, fell of his bike on his way to a football game and severely injured his leg. Ali knows that he’ll have to go through a few more weeks of physiotherapy before getting back on his feet, but the doctors are very positive about his recovery. For others, the road to walking again will take more time. 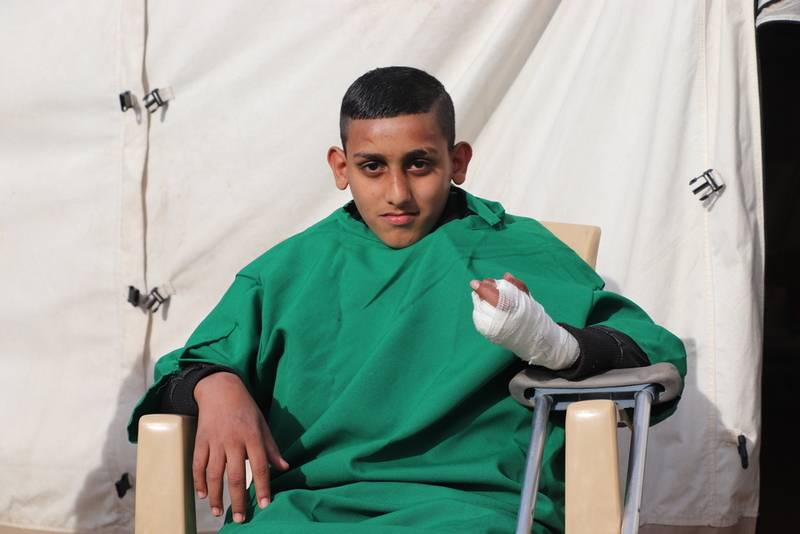 12-year-old Abdallah sits outside the ward. He has just finished his rehabilitation session and tries not to show how exhausted he is from the exercise. He only has one leg and cannot be fitted with a prosthetic yet. 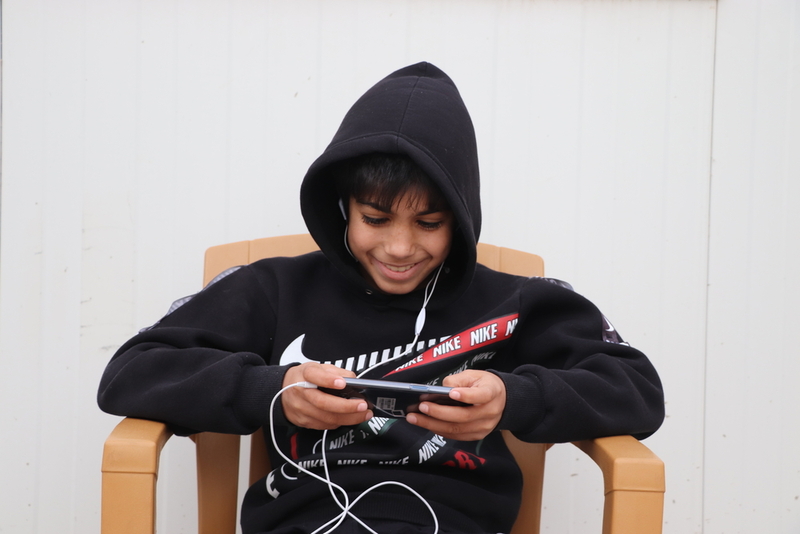 In summer 2018, Abdallah was injured in an explosion that he thinks was a landmine. His brother was with him and died instantly from the blast. “The doctors tried to save my leg, but they couldn’t. I stayed at the hospital for a month after my injury, and then went home. Without my leg and without him.” Since then, Abdallah has passed through various hospitals to get his wounds checked. Almost a year later, he still hasn’t fully recovered. When he was admitted to MSF’s post-operative care facility a few weeks ago, doctors found out that Abdallah had antibiotic resistance. “That’s why everything is taking so long to get better,” he sighs. 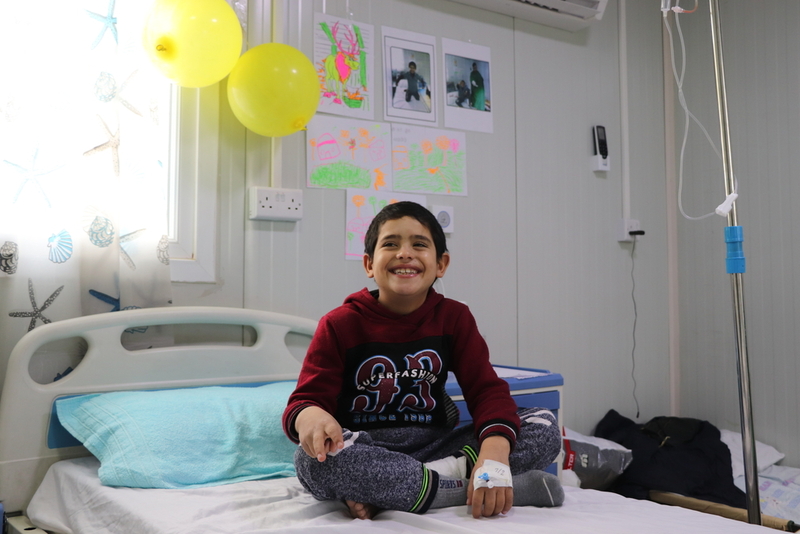 Abdallah, 12, was injured by an explosive weapon in Mosul in the summer of 2018. Salim’s friend Saif is one of the facility’s youngest patients. He has been here for a month. His family were displaced by the recent conflict and live in a camp not far from Mosul. “Life in the camp was not easy, but I was still happy because I got to go to school. One day, another boy at school threw a big rock at me and it broke my leg,” he explains. Saif went from one hospital to the next, before ending up at MSF’s facility in East Mosul. There, MSF teams found out he also had antibiotic resistance. “The doctors tell me it is taking longer [to recover] because I have bacteria in my body and these bacteria make it harder for my leg to become normal again. And these bacteria can hurt other people too, so the doctors put me in this isolation room.” MSF’s mental health and health promotion teams visit Saif and other patients suffering from antibiotic resistance each day to help them cope with the conditions of their treatment. Saif, 9, injured his leg at school. He is being treated at MSF’s post-operative care facility, in East Mosul. *Forty percent of patients admitted between April and mid-November 2018 had a microbiologically confirmed infection. Among those, over 90 percent had a multi-drug resistant infection. Sixty percent of admitted patients did not have a confirmed infection (either did not have any clinical signs of infection or had some signs compatible with infection but it had not been confirmed). MSF has been providing lifesaving services for people caught up in the violence in and around Mosul since late 2016. Throughout 2017 and 2018, MSF ran a number of trauma stabilisation posts in East and West Mosul, and ran a range of services, including emergency and intensive care, surgery and maternal healthcare in four hospitals and mental health services in three primary healthcare centres. In April 2018, MSF opened a comprehensive post-operative care facility in East Mosul. With more than 1,500 staff members in Iraq, MSF delivers primary and secondary healthcare, services for expectant and new mothers, treatment for chronic diseases, surgery and rehabilitation for war-wounded, mental health support, and health education activities. 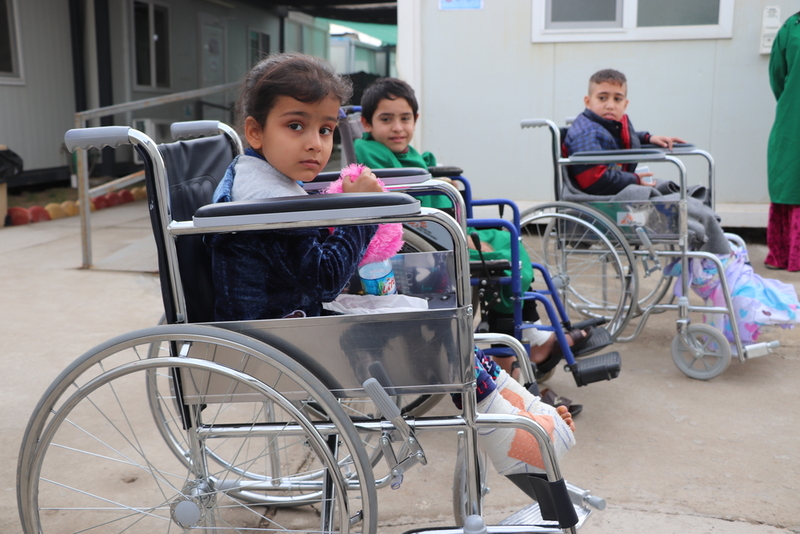 MSF currently works in the governorates of Erbil, Diyala, Ninewa, Kirkuk, and Baghdad.